Marching Cougars at the St. Patrick’s Day parade in Downtown Freehold on March 12. Have you thought about joining the school band? The school band is one of the best groups you can join at school. It is run by the school band director, Mr. Maniaci. The students have gained so much musical creativity under his direction. “Hard work and discipline makes beautiful music.” The high school music department offers so many different exciting ensembles, such as marching band, concert band, commercial ensemble, and pit band. There are also so many events that the school band participates in throughout the school year where students have memories of a lifetime. In full circle, this year has been an unforgettable year for CNHS Music. It all began back in August with marching band. The season lasted from September until early November, when the marching Cougars went to football games and marched in parades. The collaboration between all the band members were very supportive. 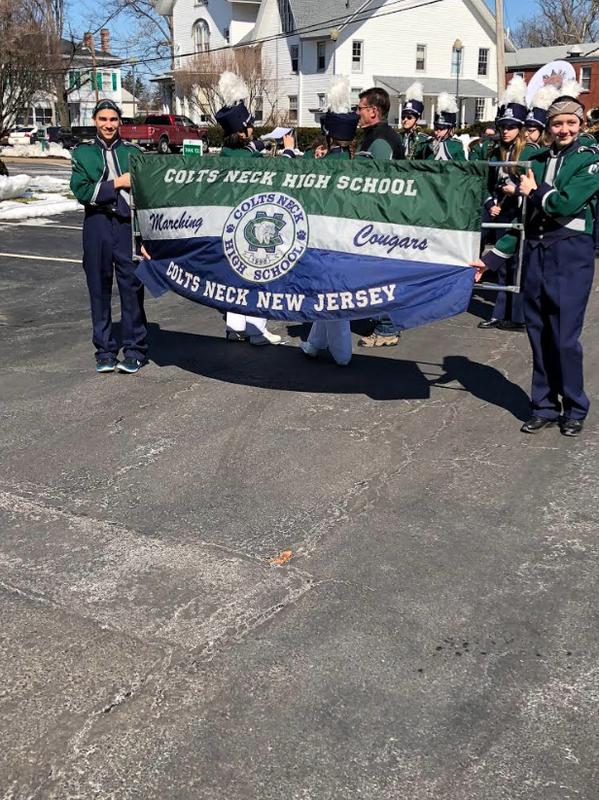 Marching season returned in January; they performed at orientation, marched in the St. Patrick’s Day parade in Downtown Freehold Boro, and wrapped up with the Colts Neck Memorial Day parade. Thanks go out to our two drum majors for all their hard work this year with the marching cougars! The concert band had a higher attendance and had an awesome year! It started when they met on the first day of school. Concert season kicked off in October at the first lesson of the year, as marching season was near its end. Traditionally, schools hold two concerts throughout the year: a winter concert in December and a spring concert in May. The commercial music ensemble also performed in both concerts has been a phenomenal part of CNHS. However, in January, the concert band performed one of their winter concert pieces, “Winter Dances” at orientation. They also headed to Colts Neck Middle School a week later in order to get a start on recruiting the eighth graders coming into high school in September. Spring Competition at Hershey High School on May 18. Pit band season took over at that time. The pit band performed in “The Wedding Singer.” The four performances took place on March 16, 17, 23, and 24. 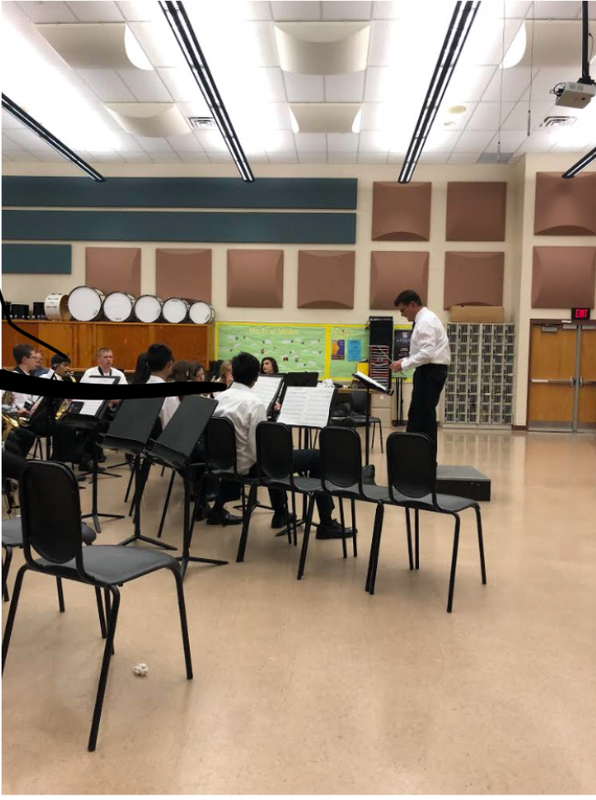 Concert Band was then resurrected shortly before spring break with the use of one after school session, until the return back to two before the traditional spring concert in the auditorium. The spring concert took place last Thursday in the auditorium, and it brought tons of tradition. One of those long time events was when all the seniors make their way to the front of the stage and tell the audience where they are heading to for college. The biggest event of 2017-2018 was indeed what most of the band members loved more than all the other events, the band trip to Hershey Park. They competed in Music in the Parks with concert bands from other schools across New Jersey. Even though they finished fifth place in their respective competition, it was with bells on that the students had enjoyed the rides at the park and had an absolute blast! Finally, the band season will come to a close when they perform the graduation song at the graduation ceremony on June 21. All in all, the 2017-2018 school year for the CNHS Music department has been a phenomenal year. From marching, to concert, to pit and commercial, this was a complete success! In closing, all of the students in the CNHS band would like to express their respect, appreciation, and gratitude to Mr. Maniaci, our beloved music director!! We give you millions of thanks to you for giving us a fabulous musical education! You are the best music director a student could ever have!! You are the best! !